Visit our on-line store for Saluki educational and training materials including Only Angels: How to Raise and Train the Perfect Saluki or Other Sighthound, and Saluki Secrets: A New Owner Guide to Living Successfully with a Saluki as well as the Hounds and Humans Cookbook and other limited edition items. All proceeds from sales benefit STOLA's Saluki welfare programs. On behalf of the dogs you'll be helping - thanks so much! If you decide to have your beloved pet immortalized by Cori, please let her know that you would like part of the proceeds to support STOLA. A collection of Saluki Note Cards, Gift Tags, Magnets, Tile Coasters (limited designs) and Luggage Tags (limited designs) created by Cori Solomon. Note Cards, including envelopes, and Gift Tags come 6 to a package. Cori Solomon will donate a portion of every sale to support Stola, so please mention that your order came through STOLA. Click the image to view a pdf file (Adobe Acrobat Reader required) of the available designs. 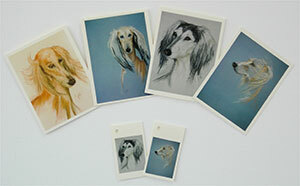 To Order Saluki Note Cards, Gift Tags or Luggage Tags contact Cori Solomon at cori@corispawtraits.com. An online community that supports non-profit organizations by providing online shopping opportunities. Great shopping for our supporters, and all of the sponsors donate a portion of proceeds to STOLA. Just enter the IGive site and select your charity of choice. Typing STOLA in the charity search engine will find us right away. Despite the bovine moniker, this is an online store which sells "cool dog stuff not found in stores". Check it out! Donate on-line with your credit card through PayPal's secure site. Just click the button below and follow the steps on the PayPal site. STOLA Saluki Tree of Life Alliance, Inc.
Now you can sign up securely via PayPal to donate a scheduled $10 per month and become a Charter Member of STOLA. PayPal will remind you each month of your payment due date, and youcan continue to lend financial assistance to helping Salukis on a regular basis. Be sure to note which dog you are sponsoring. When a loved one passes, whether canine or human, what better way to remember them than to create a memorial page which also helps to save the lives of Salukis in need. To obtain information on creating a memorial page for a loved one, please contact us at stolarescue@earthlink.net or visit the Memorial Requests Page. Meet our Rescue Team and learn about STOLA's history.